You and your young one will enjoy this book set to the words of the familiar holiday song. The letters on the dreidel are incorporated into the colorful illustrations. The end of the book includes a pop-up surprise: three children playing with a dreidel that spins as you open and close the book. Count the lights of the menorah with this colorful and informative counting book. Each page shows one more candle through the stenciled pages with Hebrew and Yiddish translations of the numbers. Candles are displayed in order from right to left. Opposite pages include images of jelly doughnuts, elephants, Maccabees and other Hanukkah fair. 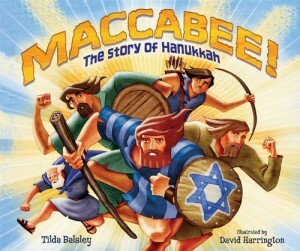 At the end of the book is the story of Hanukkah. Great for the littlest celebrators with lots to look at and sturdy pages. Great for those who are a little older and more aware of the tradition. Pastel illustrations add to the text and the end of the book includes the story of Hanukkah and an explanation of some Hanukkah symbols. An awesome book to add to your Hanukkah collection.